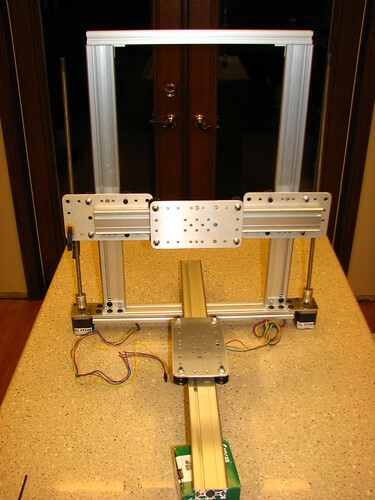 Building CNC Machines - Laser/Routers/Etc. I was on the verge ordering parts to build a MendelMax printer when Bart first posted the original ORD Bot design. I'm using the standard wheel carriage plates, and in the process of cutting out the motor & idler pulley brackets. With luck, I'll be able to finish up and test the Z-axis tonight. The build is definitely a work in progress, but I'm having a lot of fun figuring out how things will work. Many thanks to Bart for creating MakerSlide & the ORD Bot design! Last edited by mike on Mon Feb 27, 2012 7:33 pm, edited 1 time in total. looks good! what electronics/extruder are you using? I'm using the RAMPS 1.4 shield & Pololu stepper drivers from UltiMachine and the MakerGear Plastruder. Yes this is excacly what I was thinking. Were the fastening angles also bought in the makerslide store? The motors are mounted and the Z-axis operational. Next up: make the idler pulley brackets. I was hoping to shoot a video of the Z-axis moving, but I think I've got a basic misunderstanding of the Sprinter firmware. I expected to see some movement after a simple "G1 Z 10" G-code passed to Sprinter... nothing happened. The motors turn if I run the RAMPS 1.4 TestCode.pde sketch, so I know the drivers are working... Any thoughts? All the limit switches are probably enabled and are expected to be wired "NC" so with them missing the printer continuously thinks it's hitting all the endstops. Do the motors make any noise at all? If the end stops aren't setup correctly in the firmware, the motors in all axes should only move in one direction. I'm not sure how picky Sprinter is about its g-code, but try giving it a feedrate. For example, G1 Z20 F160. It is most likely your limit switches. On the RAMPS, a quick solution it to short out the pins using a standard push on header jumper. You might be able to steal one off an old hard drive. You can fix it in the controller software, but this is only temporary, so why change the software twice. At that length you will probably get some whip in the lead screws when the z is low. I would make a simple keeper at the top. it can double as a thrust bearing. You could use some shorter screws until you are printing, then print some keepers for the top. "If you didn't build it, you will never own it." In any case, got the Y & Z axes working!